Discover the remote north-western coast of Galicia, walking along deserted beaches and cliffs above the wild coastline to isolated lighthouses and viewpoints. Stay off the beaten track in the small beach resort of Laxe and the quiet fishing village of Camarinas. Join trip in the historical coastal city of A Coruna, on the north-west coast of Galicia. If you arrive early you could explore the old town, and the seafront promenade. On an elevated headland on the waterfront is A Coruna's most famous building 'La Torre de Hercules', an impressive tower and the oldest functioning lighthouse in the world. The origins of the tower are thought to date from Roman times, and it has come to be the symbol of the city. Today we travel south for approximately 45 minutes to the colourful, old fishing village of Malpica. From here we start our first walk along unspoilt beaches and cliff tops towards the lighthouse on the cliffs of Punta Nariga. On a clear day we will have great views both of the coastline and over to the uninhabited Sisargas Islands a mile off the coast. From Punta Nariga we then travel to Laxe, the small coastal resort that will be our base for the next three nights. Today's 18 kilometre walk is expected to take around six hours with 460 metres of ascent and 445 metres of descent. This morning we have a short drive to the small hamlet of A Telleira to the east of Laxe, from where we head inland. Following a small river we discover the remains of ancient watermills, an iron age 'castro' near the village of Borneiro, and Dombate Dolmen - a megalithic tomb. We then head towards the coast via Monte Castelo (305m) which has stunning views down to the sea, before following a coastal trail back to Laxe. Today's 17 kilometre walk is expected to take around six hours with 500 metres of ascent and descent. Leaving from the hotel we walk around the cape north of Laxe and along Monte Insua until we reach Praia das Cristales - a beach sparkling with eroded glass stones that reflect in the sunlight. Later we arrive to Camelle beach, a small coastal village of coloured houses. Here we can paddle, or swim if the conditions are right, before returning to Laxe by minibus. Today's 15 kilometre walk is expected to take around five hours with 250 metres of ascent and descent. Today starts with a drive to a remote coastal area close to Santa Marina village. From here we walk along beautiful wild coastline to the natural sandy beach of Playa do Trece, and Cemeterio de los Ingleses - commemorating the sinking of HMS Serpent in 1890. We then head for the Cape Vilan lighthouse visible on the nearby peninsula and follow the coast round to Camarinas, the fishing village where we will stay for the next two nights. Today's 19 kilometre walk is expected to take around six hours with 300 metres of ascent and descent. After a short drive south to Muxia we start today with a visit to Nosa Senora da Barca church, a religious sanctuary with a dramatic coastline position. We then travel to nearby Praia do Lourido and make our most challenging walk on the Costa da Morte, from here to Spain's most westerly point, Cape Tourinan. Several fairly steep ascents and descents are rewarded by fabulous views along the coast and out over the Atlantic Ocean. At the end of the day we return to Camarinas by minibus. Today's 14 kilometre walk is expected to take around five-and-a-half hours with 800 metres of ascent and descent. 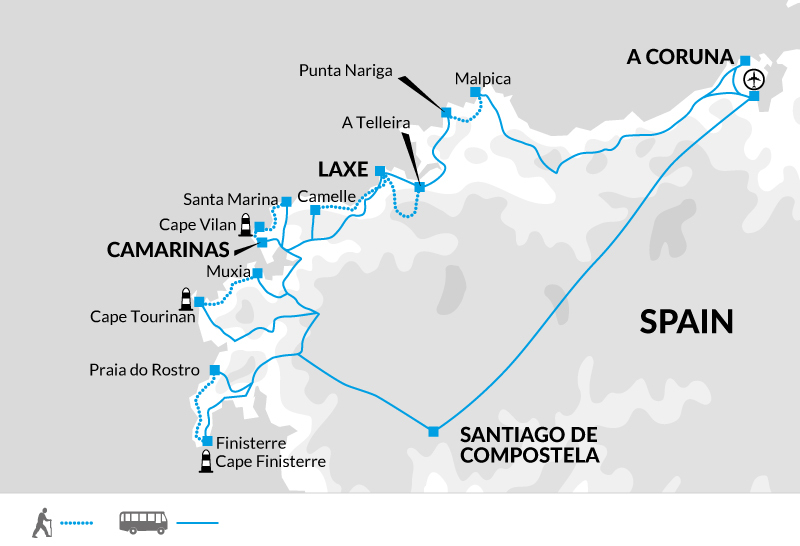 This morning we drive for approximately an hour to Praia do Rostro to follow the trail along the coast to Cape Finisterre - historically thought to be the 'End of the World'. The path gives us more stunning views down to the coast from the high cliffs along the way. Cape Finisterre is also the end of the extended Camino de Santiago, which is marked with a typical camino scallop shell way marker by the lighthouse at the furthest point of the peninsula. After a rest and photo stop we will have a short time in the small town of Finisterre before driving inland to Santiago de Compostela where we will spend our last night. The rest of the afternoon and evening is free to wander the city's narrow streets. Visit the magnificent cathedral, a stunning architectural landmark with Romanesque, Gothic and Baroque features, discover some of the city's other architectural treasures and enjoy the local food and wine. Today's 11 kilometre walk is expected to take around five-and-a-half hours with 700 metres of ascent and 600 metres of descent. Our tour ends today after breakfast in Santiago de Compostela. If you're booking your own flights then please ensure that you let us know whether you're departing from Santiago or La Coruna Airport so we can arrange your transfer accordingly. Bring one main piece of luggage and a 20-30 litre day sack is recommended. You will need to carry what you need for the day which may include a raincoat, jumper, camera, sun-cream, water and picnic lunch. On hot days you will carry fewer clothes but more drinking water. Main baggage will be transported between nightstops. Although entirely voluntary, tipping is a recognized part of life in this region of the world. Some local staff will look to members of the group for personal recognition of particular services provided. In order to make things easier for you, the Explore Leaders may organise a group's tips kitty and if this is the case, they will account for it throughout the trip. Accordingly, we recommend approximately 15€ per person for tipping. 10% is recommended at meal times. Accommodation and service levels in Spain are generally very good. We try to use smaller, family-run hotels and pensions that might not offer the same luxuries as larger chain-style hotels, but they do provide a warm welcome, a comfortable place to stay and the chance to gain a better understanding of local life. One thing to be aware of in Spain is that breakfast tends to be a smaller affair, often just fruit juice or coffee and a pastry. Day five and six Hotel we stay at O Parranda, graded as simple. The rooms feature tiled floors and simple decor, they are all ensuite with central heating and some also have views of the port. The hotel is located a short walk from the beach. 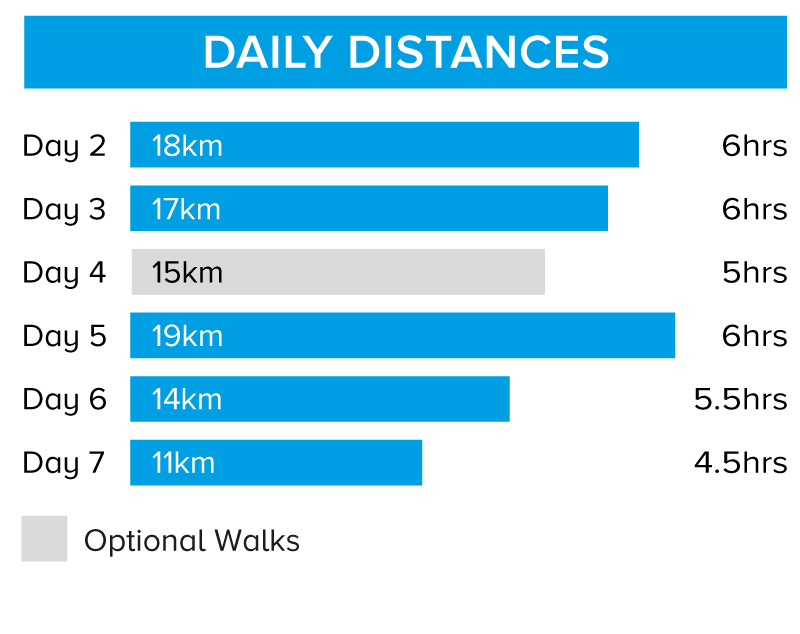 Walks on 5 days for between 4.5 to 6 hours each day. Walk along well-defined undulating coastal paths and sandy beaches. There is little shade along the routes and in spring time especially the vegetation on the trail can be overgrown. Get off the beaten track and explore the wild, remote coastline of north-west Spain.